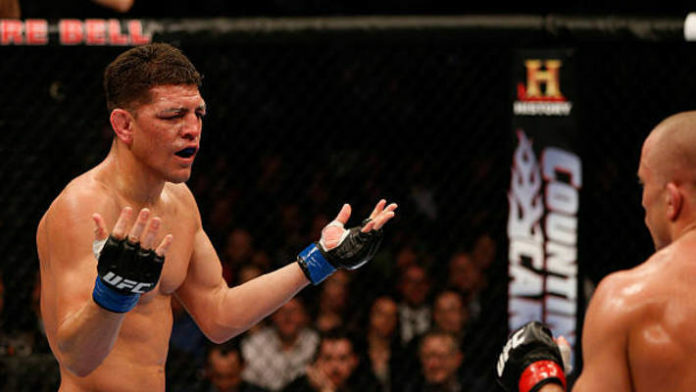 Nick Diaz is aware of Georges St-Pierre’s retirement and he isn’t shedding tears. St-Pierre announced his retirement from mixed martial arts competition earlier today (Feb. 21). The two-time Ultimate Fighting Championship (UFC) welterweight title holder and former middleweight champion makes his exit from the sport with a record of 26-2. While the MMA community paid respect to St-Pierre, Diaz took a different route. Diaz challenged St-Pierre for the UFC welterweight title back in March 2013. Diaz lost the fight via unanimous decision. Since that time, Diaz has been claiming that St-Pierre missed weight but was given a pass and that “Rush” was on steroids. Diaz hasn’t competed since Jan. 2015. He initially dropped a bout with Anderson Silva, but the fight result was changed to a No Contest when Silva was popped for banned substances. Diaz recently said he’d rather party than continue fighting. A March 2 showdown with Jorge Masvidal was originally in the cards for Diaz, but those plans went awry. Diaz claimed he never agreed to the UFC 235 match-up. Masvidal will instead meet Darren Till on March 16.